The scheduling hierarchy is shown in Fig. 23.4. 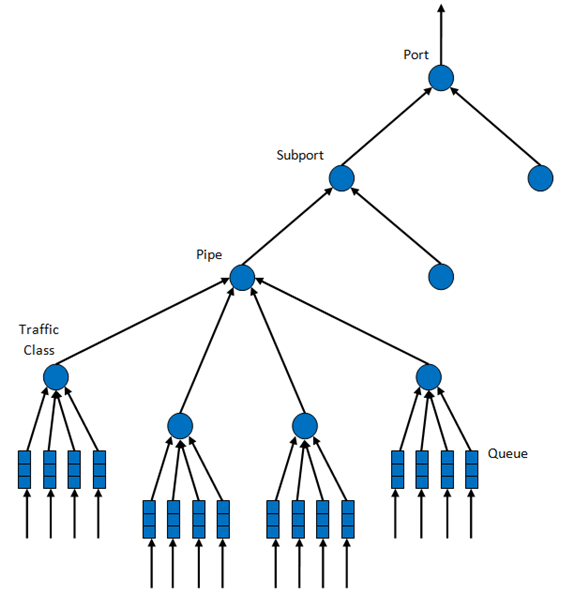 The first level of the hierarchy is the Ethernet TX port 1/10/40 GbE, with subsequent hierarchy levels defined as subport, pipe, traffic class and queue. Fig. 23.6 illustrates a pipelined implementation for the enqueue operation with 4 pipeline stages and each stage executing 2 different input packets. 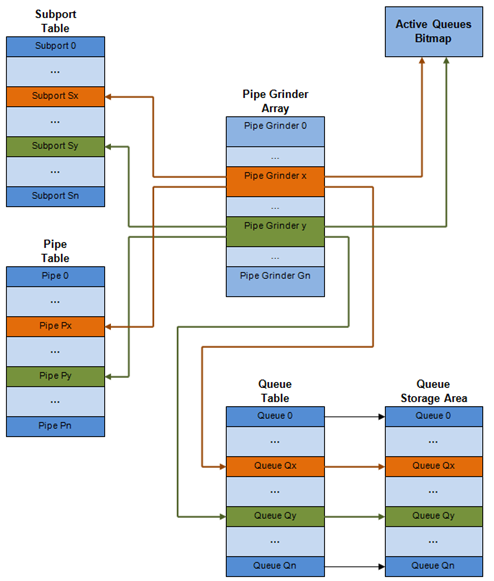 No input packet can be part of more than one pipeline stage at a given time. The token bucket generic parameters and operations are presented in Table 23.6 and Table 23.7. To implement the token bucket generic operations described above, the current design uses the persistent data structure presented in Table 23.8, while the implementation of the token bucket operations is described in Table 23.9. 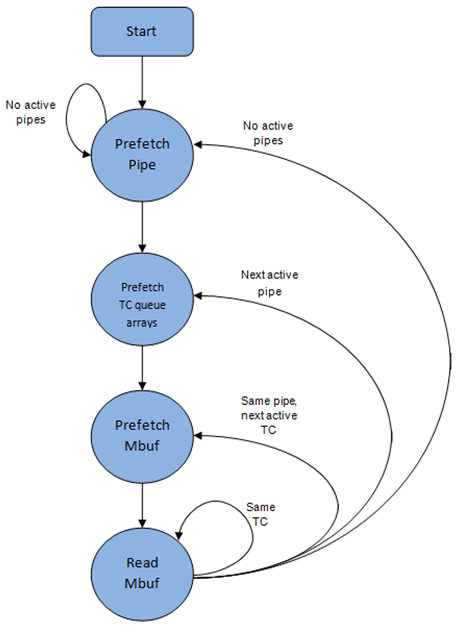 The traffic classes at the pipe and subport levels are not traffic shaped, so there is no token bucket maintained in this context. The upper limit for the traffic classes at the subport and pipe levels is enforced by periodically refilling the subport / pipe traffic class credit counter, out of which credits are consumed every time a packet is scheduled for that subport / pipe, as described in Table 23.10 and Table 23.11. The evolution of the WRR design solution from simple to complex is shown in Table 23.12. When demand is low, the watermark is set high to prevent it from impeding the subport member pipes from consuming more bandwidth. The highest value for the watermark is picked as the highest rate configured for a subport member pipe. Table 23.14 and Table 23.15 illustrates the watermark operation. The purpose of the DPDK dropper is to drop packets arriving at a packet scheduler to avoid congestion. 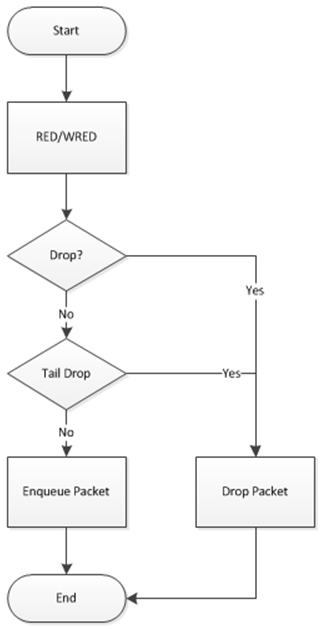 The dropper supports the Random Early Detection (RED), Weighted Random Early Detection (WRED) and tail drop algorithms. Fig. 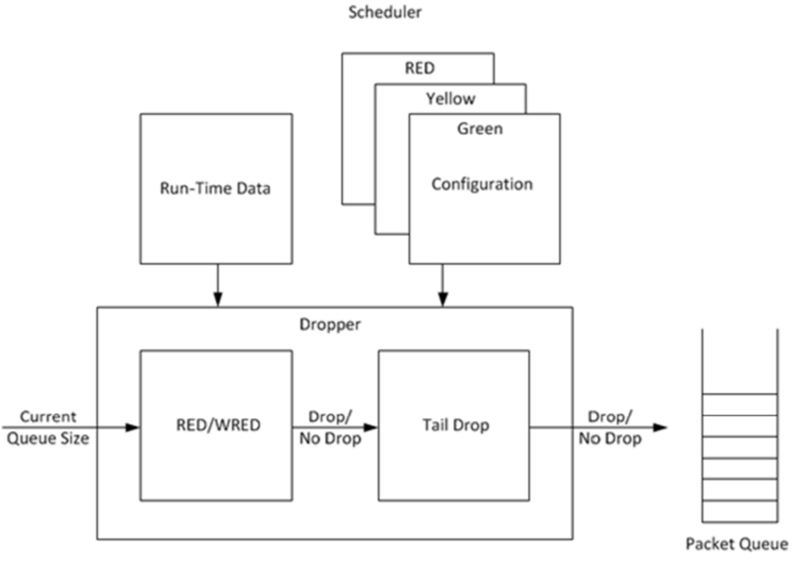 23.8 illustrates how the dropper integrates with the scheduler. The DPDK currently does not support congestion management so the dropper provides the only method for congestion avoidance. The flow through the dropper is illustrated in Fig. 23.9. The RED/WRED algorithm is exercised first and tail drop second. A RED configuration contains the parameters given in Table 23.16. In the example shown in Fig. 23.10, q (actual queue size) is the input value, avg (average queue size) and count (number of packets since the last drop) are run-time values, decision is the output value and the remaining values are configuration parameters. The method that was finally selected (described above in Section 26.3.2.2.1) out performs all of these approaches in terms of run-time performance and memory requirements and also achieves accuracy comparable to floating-point evaluation. Table 23.17 lists the performance of each of these alternative approaches relative to the method that is used in the dropper. As can be seen, the floating-point implementation achieved the worst performance. 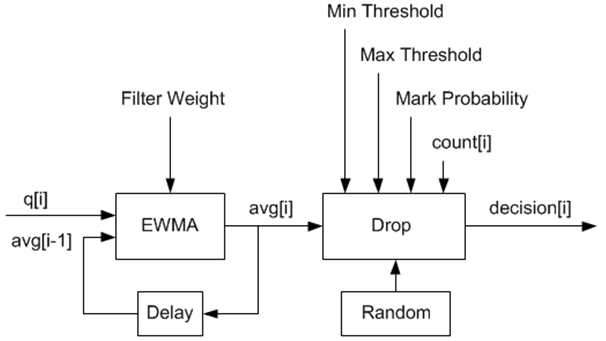 The calculation of the packet drop probability using Equation 3 is illustrated in Fig. 23.11. 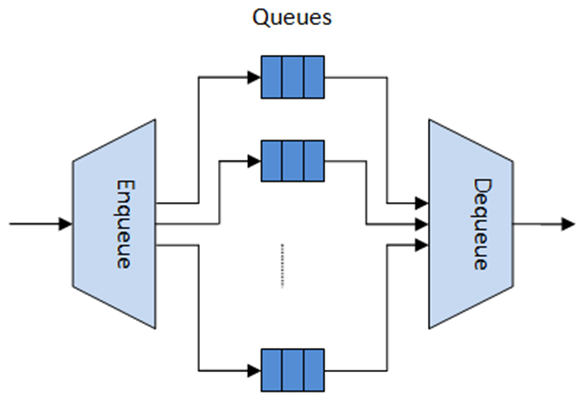 If the average queue size is below the minimum threshold, an arriving packet is enqueued. If the average queue size is at or above the maximum threshold, an arriving packet is dropped. 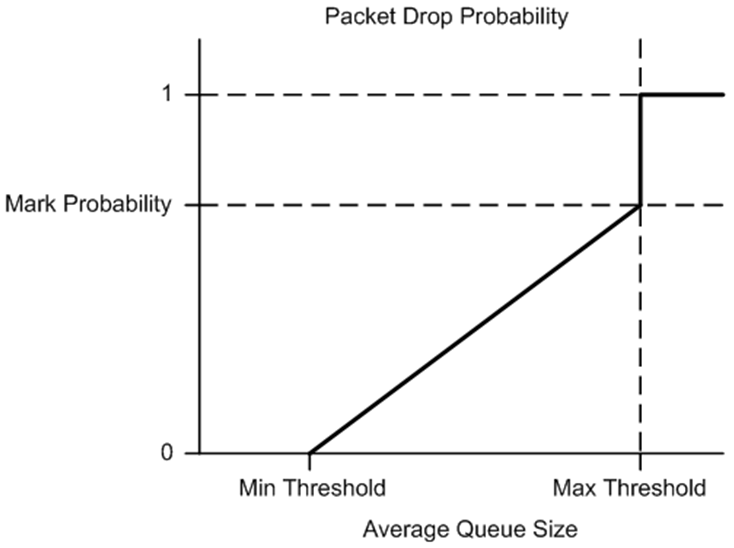 If the average queue size is between the minimum and maximum thresholds, a drop probability is calculated to determine if the packet should be enqueued or dropped. The initial and actual drop probabilities are shown in Fig. 23.12. 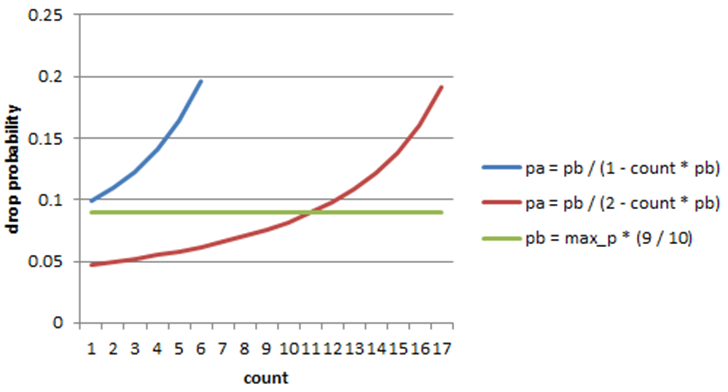 The actual drop probability is shown for the case where the formula given in the reference document1 is used (blue curve) and also for the case where the formula implemented in the dropper module, is used (red curve). The formula in the reference document results in a significantly higher drop rate compared to the mark probability configuration parameter specified by the user. The choice to deviate from the reference document is simply a design decision and one that has been taken by other RED implementations, for example, FreeBSD* ALTQ RED. With this configuration file, the RED configuration that applies to green, yellow and red packets in traffic class 0 is shown in Table 23.18.